Novelist and political activist Howard Fast, an avowed Communist who writes regularly for the pro-Stalinist Daily Worker, agrees to speak at a concert featuring baritone Paul Robeson and folk singer Pete Seeger. The concert is organized by a group called People’s Artists, and slated to take place at a picnic ground just north of Peekskill, New York. The concert is to benefit a group called the Civil Rights Congress, fighting for a stay of execution for six African-American youths sentenced to death in New Jersey. Paul Robeson - Robeson is a vibrant figure among American leftists and radicals: the son of a runaway slave; an all-American football player at Rutgers; the first African-American to play the title role of “Othello” in a mainstream theatrical production; a world-renowned singer; and an avowed Marxist who has spent extensive amounts of time in the Soviet Union. Previously lionized by many Americans, his popularity soured when, after World War II, he began speaking out ever more forcefully in favor of the Soviet way of life, and against American capitalism and democracy. As a result, Robeson is now an extremely controversial and polarizing figure. Many perceive Robeson as author Roger Williams later describes him: “the personification of near-treasonous anti-Americanism.” [American Heritage, 3/1976] The concert never takes place; instead, the grounds and audience are attacked by an angry, violent mob (see August 27, 1949). Paul Robeson. [Source: Paul Robeson Community Center]A concert organized by various left-wing organizations and slated to take place at a picnic ground near Peekskill, New York (see Mid-August - August 27, 1949) never happens. Instead, the organizers and audience members are attacked by an angry, violent mob. Initial Media Responses Relatively Favorable to Mob - The first media reports and commentary about the concert are far more supportive of the mob (see August 28, 1949, and After) than later examples (see Mid-September 1949). Second Attempt - Within hours, Fast and the concert organizers decide to reschedule a second concert, this time to be protected by large numbers of burly union workers (see September 4, 1949, and After). After a concert organized by leftist groups in downstate New York is attacked by an angry, violent mob (see August 27, 1949), initial media reports tend to support the mob and blame the concert organizers for the violence. The New York Times writes that it “regretted” the actions by both the concert organizers and the mob in what it calls “the Peekskill affair.” The New York Herald Tribune says the mob violence was deplorable but “understandable.” Other papers celebrate the violence. Significantly, the New York News reports two days later: “Frank Niedhart, manager of the Niedhart Fife and Drum Corps, today said that his organization did not participate in Saturday night’s anti-Robeson [American Legion] parade because many of the members are minors. He said he did not want to bear the responsibility of possible injury to the youngsters if trouble should develop.” Subsequent media reactions are far more critical of the riots (see Mid-September 1949). [Fast, 1951; White Plains Reporter Dispatch, 9/5/1982] The local district attorney will join the area media in blaming the concert organizers, not the mob, for the violence (see September 1949). Hundreds of volunteers, mostly union members, form a “human wall” to defend the concert and its audience from the mob. [Source: Howard Fast]Left-wing activists make a second attempt at holding a concert outside of Peekskill, New York, featuring African-American singer and activist Paul Robeson. After the first one was disrupted by angry mobs (see August 27, 1949), organizers plan for a much more strongly defended second event (see August 28-30, 1949). The venue for the first concert is heavily damaged by the mob’s depredations, so a German-American landowner named Stephen Szego, who escaped Hitler’s Germany years before, agrees to let the concert take place at the now-abandoned Hollow Brook Country Club ground. (Activist and novelist Howard Fast, who helps organize the event and documents it, will later note that Szego will suffer an attempt to burn down his house and has bullets fired through his walls as a result of his generosity.) The defense, organized by dozens of trade union workers, is designed to be unique, Fast will write: “a defense without weapons, a defense, if possible, without a blow being struck, a defense which would achieve its purpose through the highest type of discipline and restraint.” As the opening of the concert approaches, some 25,000 people—far more than the organizers had anticipated—begin streaming into the country club’s grounds; outside the grounds, a large mob begins to grow. In addition, a large and well-armed police contingent is on hand. According to Fast, the opening salvo of rock-throwing from the mob is ordered by the police: “Backed by hundreds of laughing cops, the American Legion heroes lined the road and heaved rocks at our defense line.” The violence escalates when several carloads of latecomers, all African-Americans, are attacked by the mob, pulled out of their cars, and beaten. An apparent assassination attempt against Robeson is thwarted when union workers flush two mob members from what is apparently a sniper’s nest; both are found with high-powered rifles. 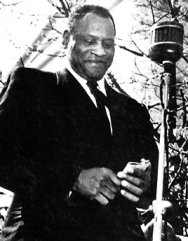 When Robeson takes the stage to sing, 15 union workers surround him, providing a “human wall,” in Fast’s words, to defend him from any possible sniper’s bullet. Robeson, folk singer Pete Seeger, and other musicians are able to play successfully, even though a police helicopter hovers over the sound truck, apparently trying to drown out the music with the sound of its rotors. Seeger later recalls: “We heard about 150 people standing around the gate shout things like ‘Go back to Russia! K_kes! N_gger-lovers!’ It was a typical KKK crowd, without bedsheets.” [Fast, 1951; American Heritage, 3/1976; White Plains Reporter Dispatch, 9/5/1982; National Public Radio, 9/5/1999] Concertgoers are attacked, beaten, and pelted with rocks by the mob as they attempt to leave the grounds (see September 4, 1949, and After). Eugene Bullard being beaten by police officers and rioters. [Source: Howard Fast]The second Peekskill concert, organized by left-wing activists and featuring African-American singer Paul Robeson (see September 4, 1949), takes place successfully after the first was disrupted by a large, angry mob (see August 27, 1949). But another mob has gathered, and though they are unsuccessful in stopping the concert from taking place, they are ready for the audience and participants at the concert’s end. Rock Attacks, Roadblocks - The audience members, with many women and children in their ranks, attempt to leave, mostly by car, and are told by security guards to roll up their windows as they are driving out, as the mob is apparently throwing rocks and other missiles. (A New York Times reporter later writes of the large piles of stones piled up about every 20 feet down one road, apparently placed their ahead of time for use as missiles.) However, the long, slow procession of cars attempting to leave the venue is halted when a small group of police officers attack the cars, including the vehicle bearing Robeson. None of the cars’ occupants are injured, though many windshields are smashed and fenders beaten in. Novelist and concert organizer Howard Fast, driving his own car, turns onto a secondary road to attempt to leave the venue, but his car is assaulted by a knot of six or seven rock throwers, accompanied by two police officers who do not throw rocks. Fast believes the police officers are there to protect the assailants if any of the cars stops to launch a counterattack. Fast will later learn that all of the secondary roads have similar knots of rock-throwing people in place to inflict damage on cars; some are blocked by piles of logs and boulders. He drives through several such ambushes, but he and the people with him escape injury. Arrests and Lawsuits - Twelve protesters are arrested; five later plead guilty to minor offenses. No one among the concert-goers and “Robesonites” is arrested. Author Roger Williams will later write: “As the victims of the violence they were hardly subject to arrest, except that the prevailing local attitude held them guilty of provoking the attacks made upon them. As the Peekskill mayor, John N. Schneider, put it, the responsibility ‘rests solely on the Robesonites, as they insisted on coming to a community where they weren’t wanted.’” Numerous civil lawsuits will be filed on behalf of groups of victims; none will be successful. 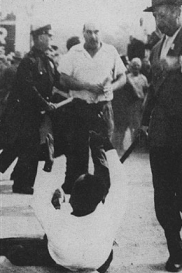 “The wounding of William Secor, rioting veteran, occurred while he was assisting in the commission of a crime.” Secor, one of the rioters who attacked the concert-goers, was apparently the victim of an accidental knifing by one of his own colleagues.